Let me preface by saying that I have very little experience with Pee-wee Herman. I only watched a handful of episodes as a child. So it did occur to me I might not be the best person to review a book on the subject. But after some thought, I decided that wasn't a bad thing. After all, I would be going into the material, unbiased. I love biographies and pop culture histories. If it was a good book, I would be drawn in regardless. Happily, I was. 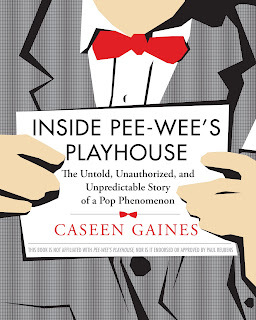 Inside Pee-wee's Playhouse is just what the title suggests, a commemorative look at the iconic children's show; from its roots, to behind the scenes looks at the show, to its fans continual devotion. Featured are many of the shows stars, producers, animators and miscellaneous crew, giving their own look into the world of Pee-wee Herman. Caseen Gaines serves as the moderator, weaving the various narratives into a cohesive story. The introduction I'll admit, had me a little concerned as it was an expression of love for Pee-wee Herman. I worried at first that the whole book might be one fan's love story. But when chapter one starts, it's with a properly outside perspective, allowing the story to develop. Told in seven chapters, the rising of Paul Reubens's cult character is told with honesty and without partiality. Caseen, while not taking sides, doesn't shy away from the slightly shadier sides of the story. Show biz, is show biz, and people are bound to get stabbed in the back along the way, or at the very least, feel as if they were. Along with the history, there are pictures of the cast and crew as well as stills from the show itself. For true fans, there is an episode guide at the end of the book with details and facts about each show. I was drawn into the story. While not a fan of Pee-wee Herman, I've always liked Paul Reubens and it was intriguing getting a glimpse of his start. However, I did have some issues with the book. For starters, I found it to be a little fractured. Despite the bulk of the book being written mostly as an objective story (though there are a couple places where that breaks as well), the episode guide is very much from a fan's perspective, peppered with opinions that seem somewhat out of place in such a guide. I would have preferred to read one that was more objective. But this is a small complaint. I should also note that while many of the cast and crew did interview for the book, Paul Reubens himself, did not, as he intends to write his own memoirs. While this in no way detracts from the book itself, I think it's only fair warning. Altogether, I found it to be an intriguing look at a show that has managed to find new audiences with changing generations of kids. I even found myself remembering bits of the show I watched as a kid and wondering if it was perhaps time to revisit it. With the show's 25th anniversary upcoming, the release of Pee-wee's Broadway production on DVD, and the slowly progressing Apatow movie impending, Inside Pee-wee's Playhouse's release couldn't have come at a better time. It's the perfect fix for die hard fans, and a great introduction for those just budding. Believe it or not, I've never seen the show. Then again, I was an adult when it was popular. I've seen the movies though. The movies are amazing. Especially his big adventure. If you can find time to read this book, you can find time to watch PeeWee Herman's Big Adventure. You will not be disappointed...Did you actually read the whole episode guide? Honestly, he's always creeped me out just a wee bit too much...and then of course, there was that whole scandal. Ick. I liked the series and my kids have watched them all and liked them too. Sounds like it could be an interesting book. I'm with Marlene. He creeps me out even more than Johnny Depp but I do like doing the Pee-Wee Herman (dance move). Hahaha @ Pat. I've not heard about the dolphin? It's always interesting to read about what happens behind the scenes of these show, me thinks. Thanks for the review! You mean I have to read the book if I want to find out more? What a gip. I thought you were going to divulge everything. I feel the same way you do about Pee Wee. Regardless, he made 'Pee Wee's Big Adventure' so that entitles him to rub one out in an adult theatre for free. But why there? Didn't he have a VCR at home?